American Cemetery is one of the cornerstones of the Natchitoches community. Established around 1737, the cemetery is only a few years younger than the town itself, and its historic landscape is filled with trees and wildlife. Historians believe that the site was the location of the second Fort St. Jean Baptiste (the first was located a short distance to the east on a site that is now submerged by Cane River Lake). It was at this fort that the first official cemetery was founded. 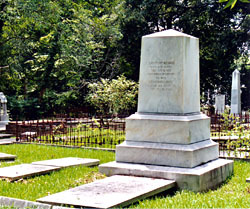 All residents of the fort were buried there, regardless of race or class. It is speculated that St. Denis, the town’s founder, is buried somewhere on the grounds. However, any marker that might testify to the location of his remains has long since been lost. In fact, there are no surviving monuments predating 1797. The American Cemetery fell into disrepair and was almost forgotten around the turn of the 20th century. In 1904, a group of local women formed the American Cemetery Association, which quickly received funds and support from the town to restore the cemetery. Their diligent efforts ensured the survival of the site and set a precedent of care and respect for the cemetery that is still honored today. In 1989, this pristine setting was used for the climactic scene of the film Steel Magnolias. The American Cemetery is still in use, giving Natchitoches an unusual link to its past. Residents can be buried mere yards away from their forefathers who moved to this region 250 years ago. This continuity has helped define the Natchitoches community, highlighting the importance of family and history to the residents of this region. 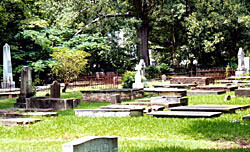 American Cemetery is located in the 200 block of Second St. within the boundaries of the Natchitoches Historic District. It is open to the public during daylight hours. American Cemetery has also been documented by the Historic American Buildings Survey.